Beauty and products: how does it all fit? ‘She Bangs She bangs, oh baby she moves she moves’ ‘Ricky Martin’s She Bangs changed my life – for the worst. My already ‘exotic’ name Shubhangini, became a punchline for my class of then 12 somethings. I escaped by dreaming about my future in which I would become a person who mattered and couldn’t be bullied anymore. But those ten minutes of imagined fame collided with my reality filled with magazines and photo-shopped images of celebrities I didn’t look like. I was your average teenager – conscious of my weight, little pocket money, acne issues and LOTS of insecurity. At 12 after having a poor reaction to a store bought product I developed my own face wash. The reaction made me realize not only did I not know what I was putting on my face but also didn’t know why I was putting it on. And so the journey of realizing how products were controlling my life and self-worth started to sink in. Finally at 29 it hit me. And Feather & Bone was born. In many ways, Feather & Bone is my way of reclaiming an adolescence lost to insecurity, photos-shopped images and empty promises. If feeding images of unachievable beauty and telling us time and time again that these are the metrics of self-worth and definition, then founding Feather & Bone was my #MeToo moment. Feather & Bone started with a basic question: How do you define yourself. 1) What are the messages these products are selling us and the impact this has on who we think we are? 2) Must products control our lives and bodies? For example, as a woman we get told we need to be beautiful and so we put pressure on ourselves to get there by using all these crazy products and ingredients, without realizing what our body needs and doesn’t. This thinking has become so engraved that we have completely forgotten our skin is an organ like our hearts, lungs or livers. Our skin regime does not need to be filled with multi steps or multi ingredients; it needs to be simple, pure and portable. It needs to work in cohesion with our skin to help it successfully complete its organ functions. 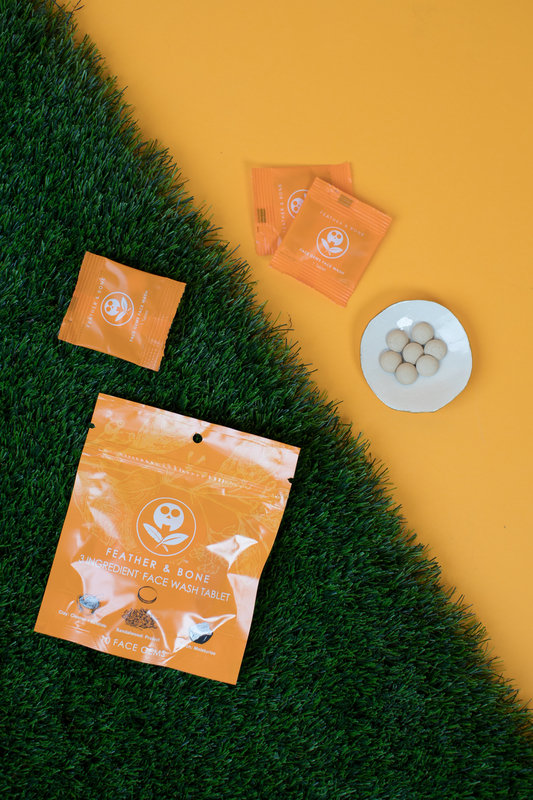 Feather & Bone is here to put the person back in personal care. Our products work with your body. We give you tips that factor in your whole life, like how a break up can affect your sleeping and eating and in turn then affect your skin. We go to the root of the problem not give you a band aid for it. We give you the tools, YOU make the change. We are there with you every day, because it is about consistency. Simple: Why a single-step process? This single dose tablet cleanses, exfoliates and moisturizes all in one go. This is all your skin needs to help it do its function as an organ. Pure: Why is this routine better? Each ingredient has been specifically chosen to help with how your skin works – so it just has 3 wholesome ingredients which are Fuller’s Earth (clay), Sandalwood and Corn Starch. We are a small bootstrapped company. Help us by sharing our mission, buying Face Gems and or adopting this new way of living and thinking with your friends and colleagues. Shubhangini is the CEO & Founder of Feather & Bone. What does Natural Really mean?